2005 Glacier Bay 2685 Catamaran Sport Fish with brand new 2009 Honda 150 4 stroke motors. We have had this boat since last spring, We put new motors, ($26,000) on it in April and have yet to put it in the water. We bought it to use at our Florida home, but then we came across a center console that was already there, so I am going to list both of them and we will sell one and keep the other........It is currently in Austin, but if it has not sold by spring, it will probably be in Cape Coral Florida, and the trailer will still be in Austin, as it will be going to Florida on it’s own bottom. 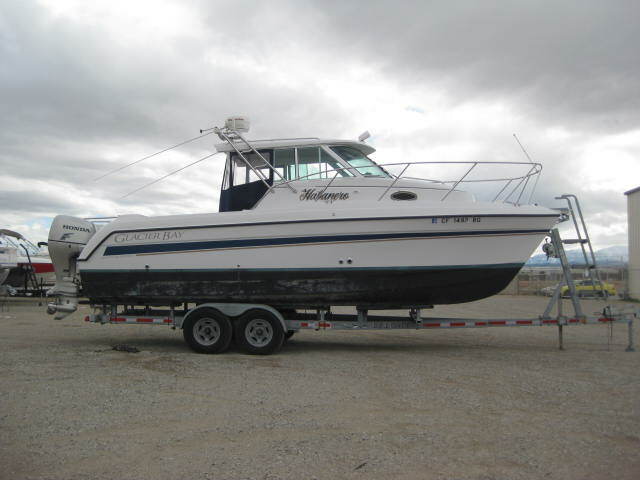 This is a very large, very nice serious fishing or cruising catamaran, It stands over 13’ tall on the trailer, which makes me wish I would have put 14’ doors in my shop instead of 12’........ Call me for details at 512-784-3659. Too late, It is off to Alaska to take tourists whale watching.